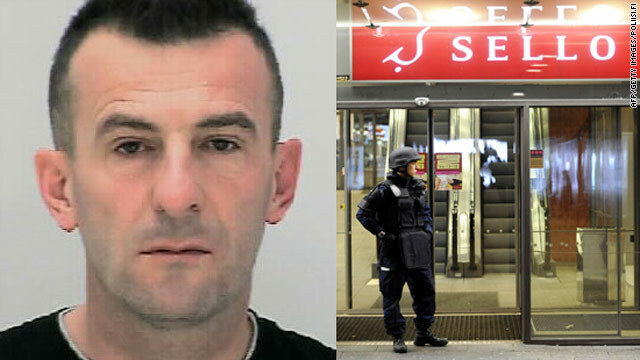 The Sello shopping center gunman has been named as 43-year-old Ibrahim Shkupolli by Finnish state broadcaster YLE. (CNN) -- A gunman opened fire inside a busy shopping center near the Finnish capital of Helsinki Thursday, leaving four people dead, police said. Before the shooting spree at the shopping center, Ibrahim Shkupolli, 43, had killed his ex-girlfriend, police said. He later turned the gun on himself at his home. 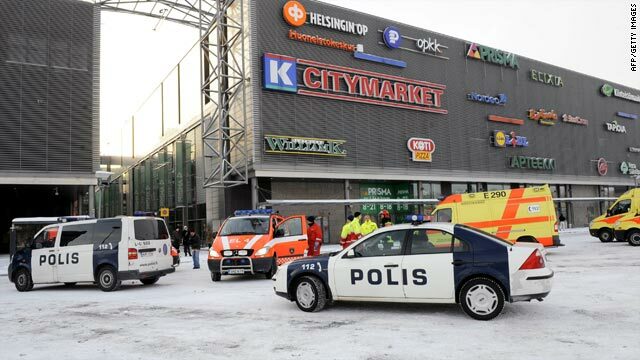 Three men and one woman were killed at the Sello shopping center in Espoo, just west of Helsinki, police said. Some were employees of a grocery store at the mall, police said. A fifth victim, also an employee of the grocery store and apparently the suspect's ex-girlfriend, was found later at an apartment in Espoo, police said. Police told a news conference hours after the shootings that they found a sixth victim, who they believed to be the shooter. Shkupolli had lived in Finland "for some time," police said, but would not divulge his nationality. "People saw a gunman, calm, walking out of the grocery store after shooting," said Mika Pettersson, editor-in-chief of Finnish news agency STT. "People first thought it was fireworks that had been exploding, but after they realized what had happened, there was a panic." State-owned Finnish broadcaster YLE said the gunman used a 9mm handgun. Restaurant manager Naresh Gaonkar, who runs the Intialainen Ravintola Curry Palace across the street from the mall, told CNN there were police helicopters overhead and many police cars driving past with armed officers after the shootings. Trains going through Espoo were stopped, Gaonkar said. Pauli Poutanen, a reporter with CNN affiliate MTV3, reported employees of the grocery store where the attack happened were evacuated so quickly that they didn't have time to put on their winter weather gear. They were waiting outside in T-shirts in temperatures as low as -10 degrees Celsius, or 14 degrees Fahrenheit, he said. Gaonkar said many of them were inside his restaurant to stay warm. Other lone gunmen have carried out two recent high-profile shootings in Finland. In September 2008, student Matti Juhani Saari, 22, killed 10 people before shooting himself in the head at Seinajoki University of Applied Sciences in Kauhajoki, Finland. Saari, who had been armed with a semi-automatic pistol and Molotov cocktails, posted YouTube videos of himself firing weapons before embarking on the massacre. Pekka-Eric Auvinen, 18, killed seven fellow students and the principal at Jokela High School in Tuusula in November 2007 before shooting himself in the head. Auvinen posted a YouTube video titled "Jokela High School Massacre" before the killing spree. In it he warned that he planned to "eliminate all who I see unfit." Brandishing a shotgun, the teenager was seen in the video wearing a T-shirt proclaiming "Humanity is Overrated." Finland enjoys a strong tradition of hunting and has a high proportion of gun ownership, with 2 million firearms owned in a nation of 5 million people.